It might not boast the most extensive sample set we've ever heard, but what it has sounds very good. High-impact samples. Decent levels of customisation. Not the most extensive collection. A 4.5GB sample library made up of 100% synthesised sounds (but no drum machines, interestingly) and aimed at media composers and electronic musicians, Juggernaut is split into two instruments: Bass and Drums/FX. The former comprises over 50 categorised source sounds, processed with eight effects modules and rhythmised with the onboard step sequencer. 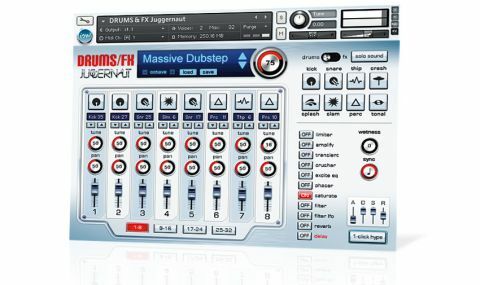 Drums/FX is built on about 450 samples (with ten round robin variations each), split into drum, percussion and FX categories, and brought together in a 32-channel mixer. Audition mode maps your selection across the keyboard, helping you explore each instrument category. Sound-wise, Juggernaut is hard-hitting, high-impact and unapologetically 'electronic'. While it might not boast the most extensive sample set we've ever heard (particularly with the Bass instrument), what it has sounds very good, and the editable parameters and effects allow decent customisation.